Maybe Your Cranky Old Cat Has Alzheimer’s! Home » Maybe Your Cranky Old Cat Has Alzheimer’s! This article was from the AVMA (American Veterinary Medical Association) Animal Health SmartBrief. Very interesting and it could explain the strange behavior of older cats. Cognitive dysfunction is already recognized in dogs, but the Alzheimer’s link has not been verified in them yet. Hopefully, as they study this phenomenon more closely, it can help in the discovery of a cure/prevention. There are some many theories that abound about the cause……..hopefully, researching the condition in other animals will find out the cause. That incessant meowing and aimless walk in the old cat may be a lot more than a sign of feline aging. Japanese scientists have discovered in the brain of wild cats protein deposits found in human Alzheimer’s patients, according to a study published in the science journal Plos One, providing new clues into the feline aging process. 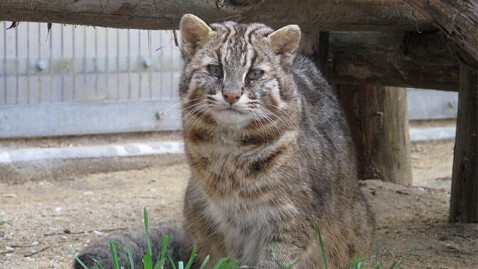 In the study, researchers examined the carcasses of 14 Tsushima Leopard cats, endangered species living on the western Japanese island of Tsushima. Brain tissue from five of them contained Neurofibrillary tangles or NFT, a protein commonly found in human Alzheimer’s patients but rarely found in animals, according to researchers. The study also detected traces of the peptide AB42, also known to cause mental deterioration. “If we closely compare changes in the brain among many different animals, we may be able to contribute to a study into the mechanism of the disease,” James Chambers, an assistant professor of veterinary pathology at the University of Tokyo, told Kyodo News. Japanese researchers say there’s no way to determine whether the Tsushima cats displayed any dementia-like symptoms because the animals were not monitored while alive. They hope to conduct a similar study on house cats, which have been known to become cranky, forget their food, walk sideways and display other geriatric behaviors. Scientists have long suspected animals suffer from a similar form of dementia as humans. A study by the University of California Davis revealed nearly a third of dogs aged 11 to 12 years old and 68 percent of those aged 15 to 16 develop some sign of cognitive impairment. In cats, 28 percent between 11 and 14 years similarly showed signs of dementia. Much like humans, veterinarians say a good diet, stimulation and companionship is key to reversing mental decline.